Can you believe that just in a few short weeks we will be spending the majority of our free time enjoying the lovely weather outside? While it seems like winter just arrived, spring is now here and summer will be short to follow. This is the time of year in which your lawn is sure to thrive and it’s a good idea to take advantage of that as much as you possibly can while you can. On the other hand, if you do not know how to properly care for your lawn, you may find that you have one or more issues with your grass as the warmth of summer becomes more prevalent. 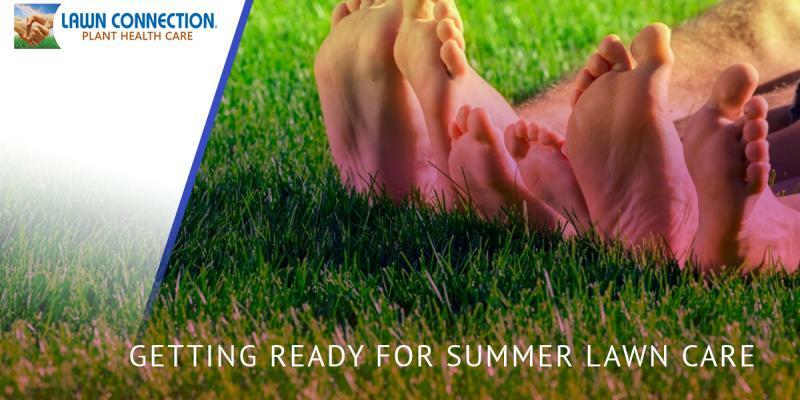 Lucky for you, the lawn care experts at Lawn Connection know how to properly inspect and diagnose any problems that may plague your grass this summer. By looking for certain clues and symptoms, we can determine what is preventing your lawn from being healthy as well as what needs to be done to fix it. ARE YOU NOTICING LAWN PROBLEMS? If you see that your entire lawn is brown, you obviously have a problem. However, many of the issues that people experience with their lawns aren’t as obvious. There are many different things that could be causing your lawn to not grow as it should. Many of which, you may not even know are occurring until it’s far too late. Let’s talk about some of the most common issues people experience where their lawns are concerned in the spring and summer. While you probably do not want to spend an afternoon on your hands and knees in the dirt checking out your soil, it may be necessary from time to time if you care about the health of your lawn. Getting on eye level with your grass can give you a much better idea if there is anything lurking beneath the surface literally. In order to check the condition below the turf, you can perform a tug test. If the grass breaks when you pull on it or if it pulls up like fresh sod, this is not a good indicator. In fact, this may be a sign that your grass is either dead, dormant or being taken over by pests. Every once in awhile, it’s important to take a good hard look at the leaf blades of your grass. The state of these blades can tell you a lot about the overall health of your grass, as well as what (if anything) is preventing your grass from being as healthy as it can be. If you see any lesions or spots of gray on the leaves, there may be a lawn disease that is steadily declining the health of your grass. If you notice these sorts of symptoms, it is important that you contact your local lawn care specialist so that the problem can be remedied as quickly as possible. If you notice that your lawn looks great with the exception of a few lined rows, it’s pretty safe to say that a lawn disease is not to blame. In the case that the issue is presenting itself in straight lines, you are probably experiencing what we call ‘mower stress,’ a common issue for residential lawns. If you need to know how to remedy the side effects of mower stress, consider contacting your lawn care company for a few tricks of the trade or simply hire us to complete your mowing for you. It’s hard to say what this spring and summer will hold. Some summers in New Jersey, the rain comes without any hesitation. On the other hand, other years there is much less rain and lawns suffer. If you notice that your lawn is beginning to look quite dry, it’s important that you know how to proceed. On average, turf needs about two inches of water per day during the summer months if you want it to remain green and lush. In order to know how long you should leave your sprinklers on for, you can place empty tuna cans in several different places in your yard. When the tuna cans are full, you will know how long your sprinklers have to be on each day for you grass to get the hydration it needs to survive. NEED HELP WITH YOUR LAWN THIS SUMMER? If you want to have the most beautiful lawn in your neighborhood or even your entire town this summer, it’s important that you hire the lawn experts at Lawn Connection. Our talented lawn care team knows how to do right by you and by your lawn. Contact us today to learn more about our residential lawn care services and how they could help you now that spring has finally arrived.